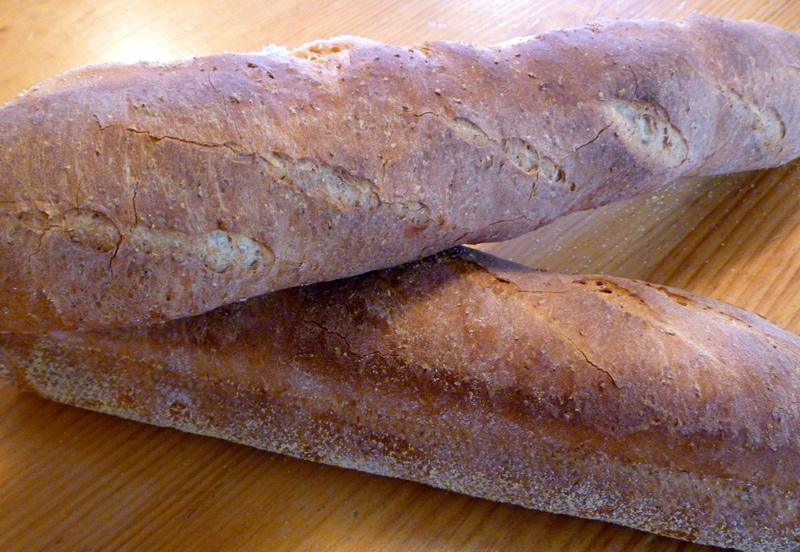 A recipe made with half whole wheat, and half white bread flour, divided into two baguette-sized loaves. This recipe is for a bread machine; I always bake it in the oven with a tray of boiling water sitting on the bottom of the oven. I’m not a fan of white bread — taste or nutrition-wise), but this bread is delicious! I have recently been trying to add whole wheat bread flour to this recipe to make it more nutritious; 1 cup of whole wheat bread flour plus 2 cups of unbleached bread flour gives pretty much the same results. This video, with chef Ciril Hitz, is excellent if you want to make better baguettes. Makes a 1.5 lb loaf, or buns. Set machine on “dough” setting, and start. Keep an eye on the dough as it is kneading; if, after 5 or 10 minutes it seems dry, or the machine is struggling, add more water, 1 tablespoon at a time, until the dough forms a smooth, soft, pliable ball that is slightly tacky to the touch. Weather will affect the amount of water the dough will need. When the dough cycle is finished, tip the dough out onto a well-floured counter or cutting board. Let it rest for a couple of minutes. Shape it into a 15″ log (or any other shape you like). Sprinkle a cookie sheet with cornmeal, or grease; the cornmeal gives the crust a nice crunch. Place the dough onto the cookie sheet and brush with oil. Cover with plastic wrap, and let rise until doubled in bulk. A good way to test for whether its ready to go in the oven or not is to poke the side of the loaf gently; if the depression from your finger remains, then the bread is ready to be baked. Preheat oven to 425F. I like to place a shallow pan of boiling water on the bottom of the oven, as this gives a crustier bread. You can slash the top, glaze it with egg wash or milk, or anything else you like to do with bread. Bake at 425F for 25 to 30 minutes, until golden brown and 200F in the center. Remove from oven, and cool on a rack. Cut the dough into 9 equal pieces. For hotdog buns, shape into ropes. For hamburger buns, shape into balls. Place onto greased or “cornmealed” baking sheet, 3″ apart. For hotdog buns, flatten till they are ½” thick. For hamburger buns, flatten slightly. Bake at 375F or until golden brown, about 12-15 minutes. Cool on rack before slicing.